There’s no goal too big for Girl Scouts to tackle—that’s for sure! Whether it’s harvesting a community garden they planted to feed the hungry, developing innovative solutions to curtail declining bee populations, or initiating programs to combat bullying in schools, Girl Scouts are the go-getters, innovators, risk-takers, and leaders who take action every single day to create a better world for us all. On September 25, 2015, the 193 countries of the United Nations adopted a set of global goals to help transform our world by ending poverty, protecting the planet, and ensuring prosperity and peace through partnership as part of a sustainable development agenda. In the agenda, UN leaders detail their ambitious and transformational vision for a better world, while providing a glimpse into our current challenges and discussing the steps we can take to solve them on an international, sustainable scale. This is where Girl Scouts comes in! As the leaders and change-makers of today and tomorrow, we are prepared to play a role and continue to work together to build a better world—much like the one the UN is envisioning. Color us inspired! And guess what? 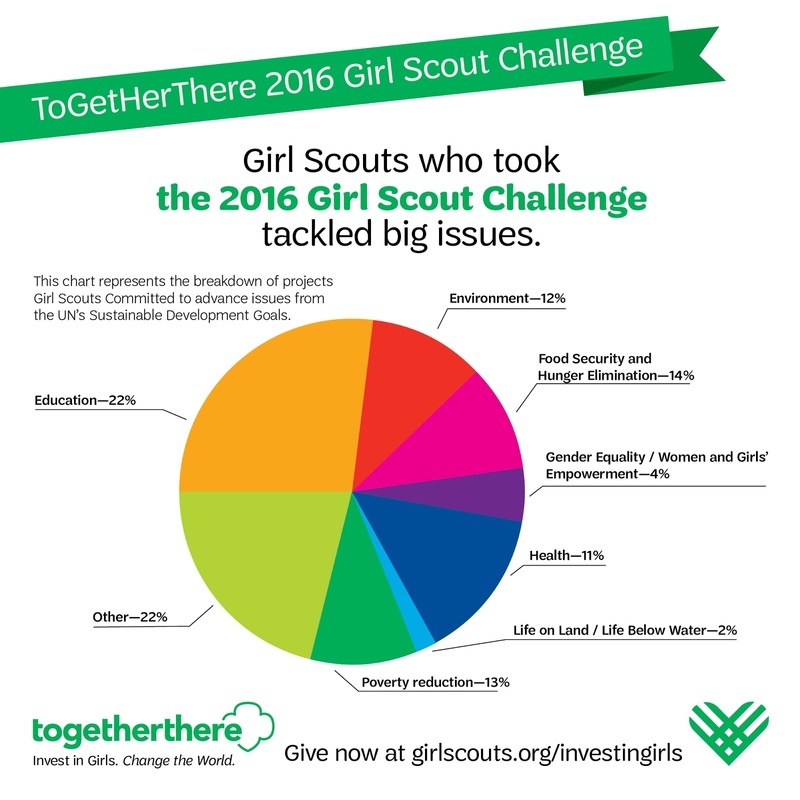 In the past few weeks alone, Girl Scouts who have participated in ToGetHerThere: The Girl Scout Challenge have clocked in over 44,000 hours of work to advance these sustainable development goals—so amazing! And what’s even more amazing? Girl Scouts participating in the challenge volunteered (on average) more than 89.46 hours, compared to a national average of 36 hours in a year. * Among the project categories of Girl Scout submissions, girls dedicated the most hours in total towards projects within education, reflecting Girl Scouts’ desire to create sustainable progress in society. Girls are not only empowering themselves, but also empowering others through education, which impacts the world’s future potential. Education was followed by, respectively, health, poverty, gender equality and empowering women and girls, food security and hunger, environment, and life on land and life below water. Check out how Girl Scouts are taking the lead to build a better world for us all, and help us show the world what girls are made of. Share these stories on social media and invest in her and your future by becoming a Girl Scout donor, today. Your investment makes possible critical, life-changing, girl-led programming, while also supporting each girl during a crucial time in her life and development—a gift that will continue to benefit her and society for years to come. Because when girls succeed, we all win. Multiply the impact. Challenge five of your friends to do the same!